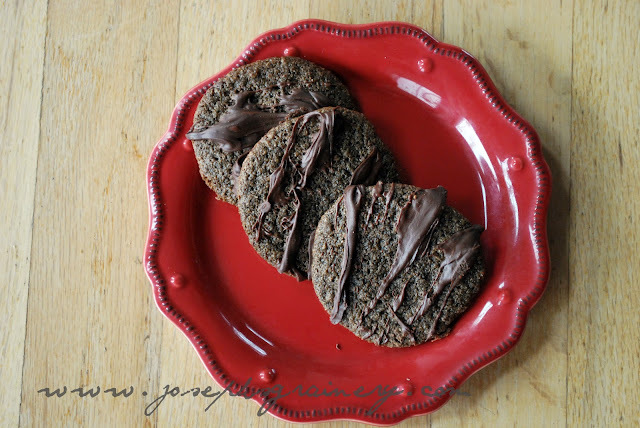 Chocolate Whole Wheat Cookies begging to be eaten. We made these Chocolate Whole Wheat Cookies a few weeks back, but somehow MaMa and I missed posting them. MaMa blames sleep deprivation, but I keep telling her she can't use that excuse much longer, now that my brother is almost 8 weeks old. If you're looking for a chocolatey, sweet treat, then these chocolate drizzled cookies will be right up your alley. Directions: Preheat your oven to 350 degrees. Line your baking sheet with parchment paper or a silicone mat. In the bowl of your mixer, cream together the butter and sugars until smooth. Add in the eggs,one at a time, and then the vanilla until blended. Slowly add the dry ingredients and mix until combined. Using a cookie scoop form tablespoon sized balls of dough, place 2-3 inches apart on the prepared baking sheet. Bake for 8-10 minutes, remove from oven and allow to rest on the baking sheet for 3 minutes before moving to a cooling rack. Place chocolate chips in a microwave-safe bowl, and melt by microwaving in 30 second increments. Drizzle over the cookies and allow to harden.